In coordination with the Occupy Canada movement and in solidarity with Occupy Wall Street in New York City, approximately 1,000 people showed up to Victoria Square for the first day of Occupy Montreal. 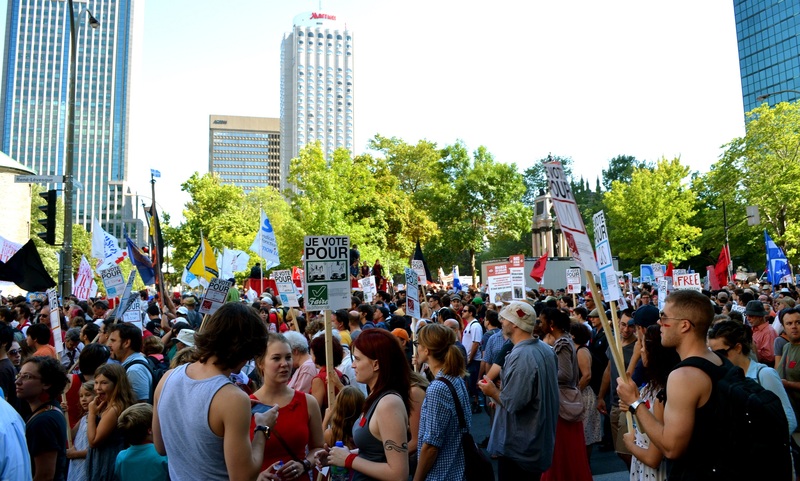 Participants in the ‘general assembly’ then decided to rename Victoria Square as “Place du peuple.” Occupy Montreal lasted about a month before police forcibly vacated the square. An estimated 30,000 students protested against the provincial government’s plan to raise tuition in the streets of downtown Montreal. Despite the downpour, a Concordia contingent left from Reggie’s terrace around 1 p.m. to meet up with other students at Parc Emilie-Gamelin. After marching through the downtown core, the movement gathered outside Premier Jean Charest’s office on McGill College. By the end of the protest, some students flocked to the James Administration building to take part in a growing confrontation. Police used tear gas and pepper spray to force protesters off McGill property. According to Montreal Police, four arrests were made that day. A group of students occupied the office of Deputy Provost for Student Life and Learning, Morton Mendelson, in protest of the administration’s decision not to uphold a referendum that would continue funding the campus radio station and a social justice organization. Students requested that CKUT and QPIRG continue to receive funding and that Mendelson step down. Administration cut off access to power and plumbing, which eventually forced students out days later. Student governors Cameron Monagle, AJ West and Erik Chevrier quickly put an end to a meeting that had not even entered open session. The three students walked out in protest because they opposed a motion made in closed session that addressed whether or not cameras and recording equipment would be allowied during meetings. When they left, the meeting lost quorum and was therefore cancelled. Concordia University became the first English post-secondary institution to join the student strike against the tuition increase. In a historic moment, undergraduate students voted in favour of a week-long general strike from March 15-22. Then-executive candidates Schubert Laforest and Lucia Gallardo were disqualified from running for the Concordia Student Union by Chief Electoral Officer Ismail Holoubi. Holoubi claimed that Gallardo and Laforest were not registered students and thus not eligible to run. Education Minister Line Beauchamp slapped Concordia University with a $2-million fine for handing out excessive severance packages and mismanaging funds. In a letter addressed to the administration, Beauchamp expressed her concern about senior administrators’ salaries and the turnover rate for those positions. The judicial board of the CSU ruled that Gallardo and Laforest should be able to participate in the general election campaign. Their affiliation presented evidence that they experienced trouble with their VISAs and were left temporarily unregistered. Both candidates were reinstated. A massive demonstration of more than 200,000 students and their supporters took to the streets of downtown Montreal to protest against the tuition fee increase. Concordia University cancelled class on both campuses that day for security reasons. It marked one of the largest protests in Canadian history and no arrests were made. When a Fine Arts Student Alliance general assembly failed to meet quorum, more than 70 students held a sit-in outside of President Frederick Lowy’s office on the 15th floor of the MB building. Students proceeded to demand another meeting so they could discuss concerns about the ongoing student strike. After an hour, Lowy emerged from his office to take part in the impromptu meeting which would be continued at a later date. Following months of student unrest and protests against the tuition hike, Education Minister Line Beauchamp stepped down from her position and from politics entirely. Beauchamp’s resignation came after negotiations between the provincial government and student groups failed. An hour later, Michelle Courchesne was appointed as the new education minister. In an effort to put an end to the tuition crisis after 14 weeks of student unrest, the provincial government passed the controversial and historic Bill 78. The bill cracks down on the size and governance of demonstrations, imposes strict fines for individuals blocking access to classes in post-secondary institutions and ended the winter semester at CEGEPs and universities affected by the strike. A Concordia University student Jun Lin was remembered in a public funeral nearly two months after his brutal murder. Family and friends gathered at Notre-Dame-des-Neiges cemetery at 9 a.m. to mourn the loss of 33-year-old Lin. His ashes were buried in Montreal, where he had started to make a life for himself. The suspect was apprehended and his trial is ongoing. Concordia University’s incumbent President Alan Shepard took office on Aug. 1 to commence his five-year mandate. Shepard was hired to replace Frederick Lowy who was appointed as interim President following the resignation of Judith Woodsworth in Dec. 2010.